In April, after a new 4,000 hp auto shredder was commissioned, Lakeside took delivery of a new Sennebogen 840 M. This model is a rubber-tired 53,000 kg purpose-built machine powered by a 227 kW Cummins engine, and fitted with a Sennebogen orange peel grapple. "It's a full-throttle lifestyle," Levell says. With the new shredder, he found that his previous material handler couldn't keep up with the challenge. "It didn't have the best balance, and it needed a lot of maintenance and downtime. I wanted something more suitable for this kind of production - a more reliable machine." 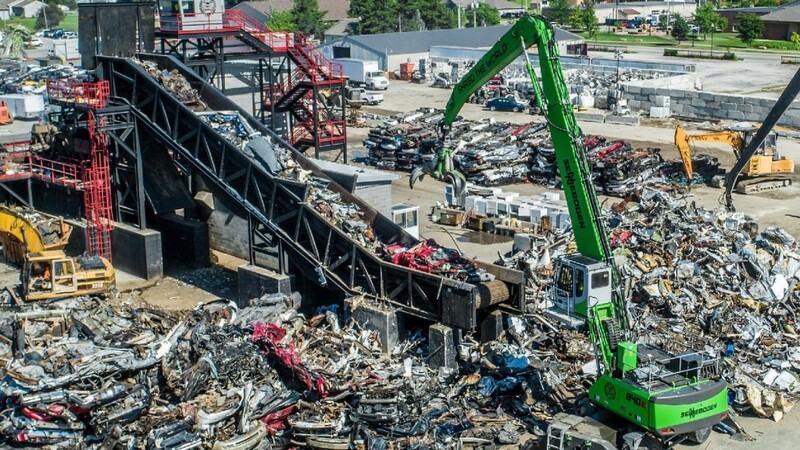 Levell had spent some time travelling to other recycling yards to see their shredder operations. What he saw convinced him that Lakeside needed a new SENNEBOGEN machine to feed his 6085. "I got down to two possible material handler lines. I really gravitated to the way the SENNEBOGENs are designed, and I learned that their service and support is really great," he said. In April, after the 6085 was commissioned, Lakeside took delivery of a new SENNEBOGEN 840 M. This model is a rubber-tired 117,000 lb. (53,000 kg) purpose-built machine powered by a 305 HP (227 kW) Cummins engine. Levell had it fitted with SENNEBOGEN's orange peel grapple. After almost a year in production, the 6085 is churning out shred as advertised and is running smoothly. The shredder sets the pace for every other aspect of the operation. "It's a hungry machine! Yesterday I watched it eat a 1-ton Chevrolet pickup in about 25 seconds," says Levell. "It can normally process two or three cars in a minute." As long as it's getting fed, the 6085 will produce of 55 tons/hr. Any problem with other equipment just gets in the way of Lakeside's mission to "Shred The World!" Lakeside is now receiving trailer-loads of cars to process from up to 100 miles away and uses the old machine to move cars into the staging area by the shredder. A wheel loader hauls away the outbound shred and fluff. "The 840's main job is to feed the shredder and keep everything going, without any downtime," Levell explains. "If you can't feed the shredder, you're pretty well out of business and SENNEBOGEN helps keep my operation going." Along with managing the business at Lakeside, Levell is often at work in the cab of the new SENNEBOGEN. "It's an amazing machine - it's really safe, really quiet, really comfortable. It has a good feel for the operator; smooth, strong and efficient. The cab is nice and quiet; you can't even hear the shredder. I love the two cameras (rear & right side), so you can see out the back and see through the blind spot next to you. And it's comfortable. When you're spending 10 hours a day in here, it's the place you want to be." Levell credits SENNEBOGEN's hydraulic design for much of its reliability. "There's no electronics. So there's less to go wrong." To date, the SENNEBOGEN has also met Lakeside's expectation for dealer support. "Murphy Tractor has been really good; right on the spot. Once we have a few more SENNEBOGENs in the yard, I'll send a couple of my guys down to the Training Center in Charlotte. For now, Murphy has been on top of all the service."